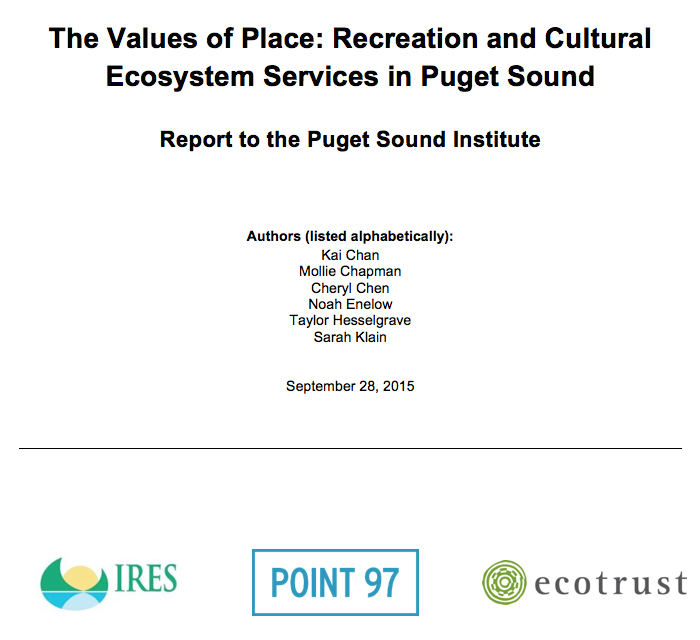 This report details research to understand recreational and other cultural values associated with Puget Sound ecosystems. It includes four components: Chapter 1, a characterization of coastal recreation and associated expenditures among residents of the region, including an analysis of how these values vary across space; Chapter 2, an analysis of sense of place and aesthetic values associated with the region; Chapter 3, an experimental analysis of willingness to pay for environmental protection through agricultural riparian buffers; and Chapter 4, analysis of interviews with farmers regarding attitudes towards riparian buffers in Snohomish County. The first component (Ch.1) details the financial impact of direct expenditures (e.g., hotel stays, dining, shopping). This study estimated the total number of recreational trips and direct trip expenditures per year among residents of the Puget Sound region. Survey respondents took an average of 2.65 trips with recreation as the primary purpose in the last year, which corresponds to 8.8 million trips per year among the study population. With respondents spending an average of $53.74 per trip, we estimated that the study population’s total annual coastal visitation trip expenditures were approximately $474.8 million. Approximately 65.1% of survey respondents visited Puget Sound in the last 12 months, for an average of 5.38 trips with the primary purposes of recreation, leisure/tourism, visiting family/friends, work or other. Of those who had made visits, the majority (63.3%) has been visiting the Puget Sound from more than ten years to all of their lives. Coastal trips in Island County and King County were most popular among respondents, constituting approximately 21.4% and 20.4% respectively of total coastal trips. The top five most popular recreational activities among survey respondents over the last 12 months were beach going (64.7%), scenic enjoyment (61.9%), hiking (43%), wildlife viewing (37.6%), and photography (31%). Our spatial analysis revealed that much of the region features memorable recreational experiences for some people, with especially popular or evocative areas along the northern edge of the Olympic Peninsula near Port Angeles, in the Hood Canal area west of Bremerton, and in the San Juan Islands area near Friday Harbor. The report’s spatial data sets and maps display the extent and intensity of use for both coastal recreation overall, and for the top ten most popular coastal recreation activities. The health of Puget Sound’s coast is linked to the environmental quality of the region’s rivers and lands. Riparian buffers can improve fish habitat and water quality, but many land-owners face trade-offs when considering the creation of riparian buffers (e.g., removing land from agricultural production can reduce farm productivity). Results of our choice experiment survey (Ch.3) in this report indicate that residents of Puget Sound demonstrate positive and significant willingness to pay (WTP) for riparian restoration, with incremental WTP decreasing at higher levels of riparian habitat quality. Survey respondents were indifferent to low to moderate levels of farmland conversion (4% to 8%) but indicated significant preference against high levels of conversion (16%). Respondents from higher-income groups and people who recreate outdoors more frequently have higher WTP for riparian restoration and farmland conversion. To better understand perceptions of riparian buffers, this report includes an assessment of famers’ attitudes towards riparian buffers in Snohomish County (Ch.4). Semi-structured interviews with full time, part time and hobby farmers examined aesthetic values, connection to place, and motivations and barriers to enrolling in voluntary riparian buffer programs. The following factors motivated farmers to create riparian buffers: possibilities for land improvement; a sense of stewardship; and the availability of technical, labor and financial assistance. Farmers want flexibility in buffer locations and width, tailored to the locally specific characteristics of their land. Flexibly structured incentive programs are more likely to induce rural landowners and farmers to create and expand riparian buffers. This report establishes an economic and spatial baseline of coastal recreation patterns; it documents the strong connections that Puget Sound residents have to their coastal ecosystems and their willingness to pay to protect these environments. Our study suggests that recreation and restoration are complementary. The results of our recreational survey indicate that recreation plays a significant role in the lives of hundreds of thousands of Puget Sound residents; our riparian buffer choice experiment results indicate that people who recreate frequently are willing to pay for restoration. The economic, cultural and social values of Puget Sound highlighted in this report can inform coastal resource management and riparian restoration efforts.